ARCADE HYATT, MAUI. These shops were commissioned for the arcade of the Hyatt Maui. 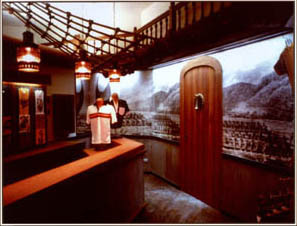 The t-shirt shop is detailed in a nautical theme and features a photo reproduction mural of a turn of the century etching of Hawaiian outriggers paddling out to greet the ships of Captain Cooke. Lanterns and authentic rigging are part of the effect. The second stop is a "jewelry box." The ceiling and walls are detailed to enhance this feeling of a jewelry case that envelopes you in luxury. 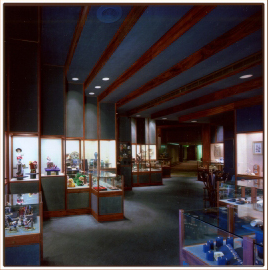 The carpet and walls are coordinated in cobalt blue velvet, with the continuous step-edge effect being in rich koa wood. 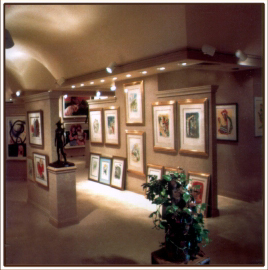 The third space is an art gallery which features uplit ceiling arches and variable down lights to spotlight the displayed paintings and sculpture. AUSTRIAN LEATHER AND CHOCOLATE. 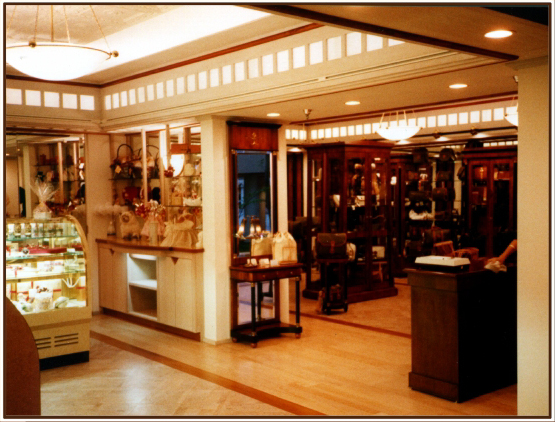 This shop was commissioned by a merchant from Vienna who imported both fine luggage and gourmet chocolate from Austria. The style is a reference to the Vienna Design Studio and manufacturer of crafts in 1910, known as the "Vienna work state." This "secessionist" group took pride in producing designs of the latest style evolving in the "arts and crafts" vocabulary. These designers were also heavily influenced by the "Biedermier" style of 1830, also made popular by Vienna craftsmen. The display furniture for leather goods highlights this look.